Home / Fundraising • Garden / Save the Date! SPEC has been an amazing supporter of our school garden and they are holding a fundraising event at our school! 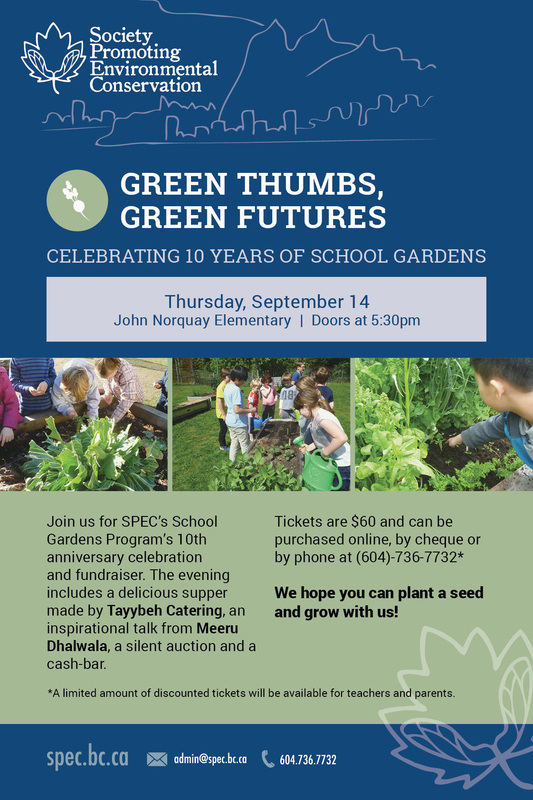 Please join us as we celebrate ten years of SPEC’s School Gardens Program during the Green Thumbs, Green Futures dinner and fundraiser. The evening includes a delicious supper made by Tayybeh Syrian Catering, a silent auction, cash-bar, and an inspirational talk from chef, author and co-owner of Vij’s restaurant, Meeru Dhalwala, titled The Love and Respect of Food for our Personal, Cultural and World’s Survival. Tickets are $60 and can be purchased online, by cheque or by phone at (604) 736-7732. We’d also like to give a big thank you our summer garden watering volunteers!!! !